UK Poker News enjoys a ride out into the country every now and again so our senior writer, Tony Bromham, took advantage of the improving weather to take a look at one of the country’s newer poker venues, Reading Sporting Club, one of the Stanley Casino chain’s pleasant establishments, which this weekend is holding the Southern Masters, a mini-festival of three no limit hold’em tournaments climaxing with a £25,000 guaranteed £500 buy-in extravaganza. It is Friday and, just for once, the sun is shining at the beginning of June, after a miserable May of rain and wind. I am cruising down the Reading A33 relief road, past the imposing, and now Premiership-hosting, football ground, the Madejski Stadium, home of Reading Football Club. I am on my way to the similarly-named Reading Sporting Club, a Stanley’s Casino on Richfield Avenue, located a stone’s throw from the site of the world-famous Reading Music Festival. This place will be crawling with all manner of music-indulging humanity come the August bank holiday but, for now, the streets are relatively quiet in the early evening. I also decided I would play the £100 tournament “The Reading Cup”. As I drew into the car park, I saw veteran poker master Malcolm Harwood, who was here to play all of the weekend’s poker. Malcolm spends a lot of time with the “A World of Poker” team including the preparations for an upcoming new poker programme to be shown on the Sky TV platform. This being the first visit to this establishment for us both, we were immediately impressed by the casino and poker room. It is a resplendent place, not unlike a mini-Vegas spread. Malcolm is a veteran of UK casinos down the years and he for one was mightily impressed with it. That seems a good enough testimonial to me! Early on I spoke to the General Manager of the casino, Jimmy Howard. He explained to me that, despite the fine outward appearance, the casino is due a refurbishment! That should be worth looking forward to. Poker itself has only been here since early February but it is now running well after some early bedding down problems. 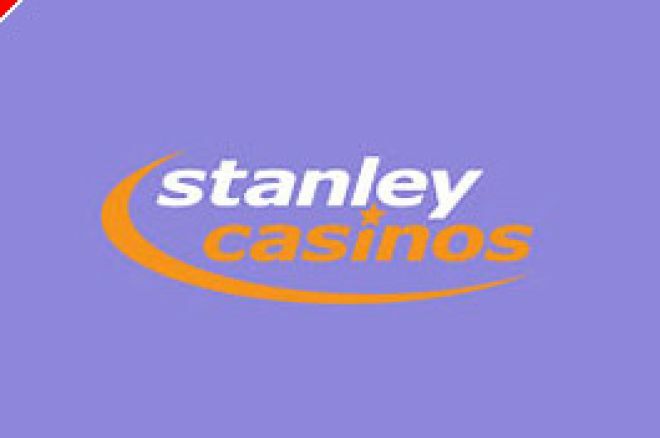 In any normal month, there are tournaments from £10 to £100 as well as cash games. They are generally self-dealt although this festival employed dealers from Stanley’s pool of dealers. Eventually, the £100 “Reading Cup” started. I sat down with a host of locals and others with 2,500 chips out of an available 5,000, this being Double Chance. For a £100 tournament, Malcolm Harwood was very impressed with the chipcount. The blind levels started at 25/50 on a 30 minute clock but this would reduce to 20 minutes from level 3, the last chance we had to take the second stack of chips. The Main Event on Sunday will commence with 15,000 chips, again a generous starting pile for a £500 tournament. That is scheduled for a 4pm start. In the £100, I saw very little early on but there was one individual at our table who announced himself a loose cannon from hand 1. On a big blind of 50, this person raised to 1,000! Soon afterwards, he was all-in. This man was my mark. Even more so when he called an all-in move on a flop and turn of A T x x. The aggressor showed 88 while our loose cannon friend showed KJ. Now, while it was true that he had a second set of chips to call upon, quite why he should call an all-in with possibly only a Q to save him (he must surely read the other player for an ace), and just the river to come, is a mystery. Anyway, the Q duly dropped and everyone knew this man was likely to be a temporary fixture around here. I had dropped a few chips but wasn’t seeing many hands. I bet at a flop of ATT with 99 but was re-raised, presumably by a 10. I folded. I decided to take my second set of chips before the end of the period because I could see I might have a use for them. Then I got AK, raised x3 and was called by loose cannon. The flop QJ3 was not encouraging but I bet out large – about 40% of my remaining stack hoping for a fold but was again called. The turn was a 9 and I instantly went all in. I felt that loose cannon was up to his drawing tricks again and he was sufficiently put off to fold. He showed A3, so he was in fact leading with the low pair. That was my reprieve and soon afterwards I doubled up with KK. A player before me put his smaller stack all-in and loose cannon called him. I re-raised to get loose cannon’s chips in the pot, which he obliged. Small stack’s JJ and loose cannon’s dominated KQ did not improve and I was up to nearly 10,000. I would like to go on but after the food break, a pleasant spread of sandwiches and pasties, my stack dwindled. I saw very few strong hands and was unsuccessful with a couple of steal attempts. I finally bowed out somewhere around the 30th place mark, I estimate, at just gone midnight. At less than 4xBB (blinds now 500/1,000) I threw it all in with A5 but AJ saw me off. By now, the quick clock and rising blinds were taking their toll and this tournament would likely be finished not too far hence. We hope to have the results in detail from all three tournaments very soon. I would like to thank the management and staff at Reading Sporting Club for a pleasant and well-run evening. I also recommend the poker venue to anyone in the South of England. It is well worth a try out!